Deconstructing the NUI: Microsoft Courier - leaked Tablet photos and video! Microsoft Courier - leaked Tablet photos and video! For a while now there have been mostly unsubstantiated rumors of an Apple tablet. It has generated enormous excitement and imagination, but Microsoft may steal all that. Gizmodo has details of the leaked photos and concept video. This is much more than just a photoshop or concept art. It is CG photos and a matching use case video of how the Courier tablet (more like paper notebook, hinge and all) would be used. It features multi-touch gestures, stylus input, handwriting, dual screens, and a camera. 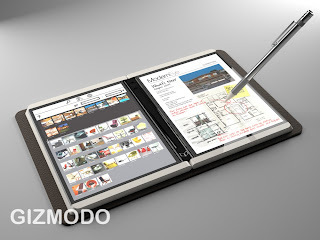 This would be the true consumer version of Microsoft Surface. Can't wait for more information. At this point I wouldn't be surprised if there was an announcement at PDC in November.